The Investment Strategy proposes a series of 24 recommendations as part of a four-part plan to integrate transportation, growth and land use planning in the GTHA, maximize the value of public infrastructure investment, optimize system and network efficiencies, and dedicate new revenue sources for transit and transportation. All proposed funds would be placed into a trust fund dedicated to The Big Move’s Next Wave of projects to provide the accountability and transparency that GTHA residents want and deserve. This new Transportation Trust Fund would be governed by a board of trustees. As well, working closely with our municipal partners is integral to delivering transit and transportation projects in the region; therefore, Metrolinx is recommending adjusting the composition of its Board of Directors to include six citizen appointees nominated by the municipalities. The accountability process would also include two mandated comprehensive reviews: a review of the Investment Strategy and its impact after 10 years; and, a fundamental review and reauthorization after 20 years to ensure the Investment Strategy continues to meet the needs of the region. Based upon the principles of dedication of funding, fairness, equity and accountability, and informed by broad and deep consultation throughout the GTHA, Metrolinx is recommending the following investment tools to fund The Big Move’s Next Wave. 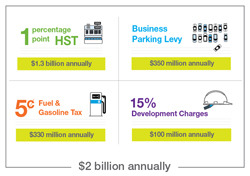 A one percentage point increase applied uniformly to all goods and service in the GTHA currently subject to the Harmonized Sales Tax (HST) would generate $1.3 billion annually to be dedicated to investment in improving the GTHA’s transportation system. Due to the nature of the administration and collection of HST at the federal and provincial levels, the Province may find it administratively necessary to introduce a percentage point HST increase across Ontario, rather than just in the GTHA. If Ontario were to implement a province-wide approach, revenue collected outside of the GTHA would be exclusively directed to priorities outside of the region. A Mobility Tax Credit is also recommended to help ensure the proposed HST increase does not disproportionately burden those with lower incomes. The cost of this credit – about $105 million annually – would be paid by the revenue generated from the tax increase. A regional Fuel and Gasoline Tax of five cents per litre would generate about $330 million annually and ensure that road users, including cars and trucks, residents and businesses, contribute fairly. Drivers would be a clear beneficiary of increased transit and transportation investments, and should make direct contributions to the improvements. A Business Parking Levy on all off-street non-residential parking spaces would generate about $350 million annually and provide a direct means for businesses across the region to contribute to the transit and transportation system. 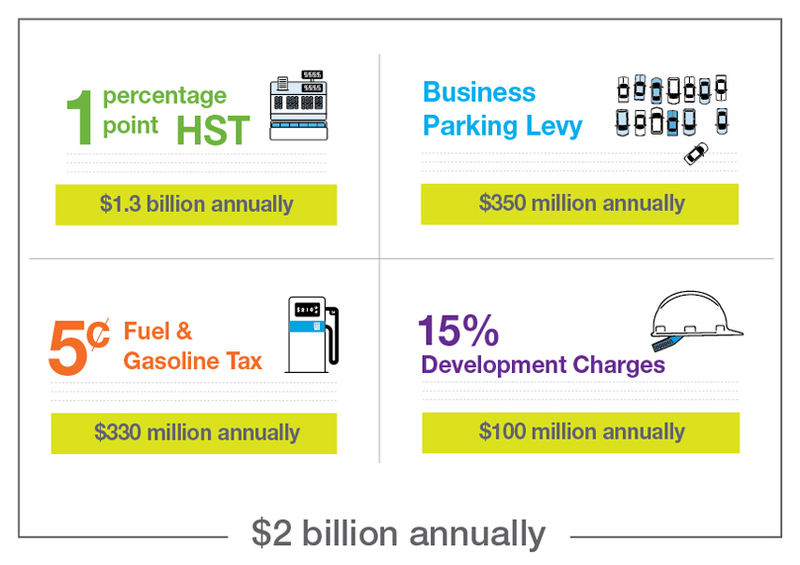 To ensure fairness across all parts of the GTHA, the parking levy would be variable, based on relative current value assessments. The average levy would be 25 cents per day per space, although the actual amounts would be based on relative assessed values. Land development is a key beneficiary of improvements to our transit and transportation system. That’s why about $100 million should be contributed annually from Development Charges, resulting from some recommended amendments to the legislation on how these fees are applied to new growth and development. Three additional tools are being recommended because of their positive policy benefits – such as improving the efficiency of the transportation network, building more walkable and livable communities, encouraging transit ridership, and making the most of the infrastructure we have. Getting more efficiency out of the highway network is a key goal of the Investment Strategy, as well as providing the resources to expand the network of High Occupancy Vehicle lanes. As we provide more and more parking at transit stations, and the cost of this dramatically increases due to the land, construction and maintenance costs of elevated parking garages, we need to think about pay-for-parking to help pay for the services that are being offered. Rapid transit, particularly around stations, can generate increased land values. Working with municipalities and developers, Metrolinx should seek contributions from benefitting landowners, related to the increased land values they enjoy. Funds generated from the Investment Strategy are intended to cover the full costs of implementing The Big Move’s Next Wave of projects, including 75% committed to capital, operating, maintenance, financing and rehabilitation costs associated with the 10 proposed priority projects, as well as 25% allocated to complimentary projects and programs for local transit, roads and highways, and other projects. The Big Move’s proposed Next Wave is a $34-billion slate of projects and programs that will continue Metrolinx’s transformation of the GTHA’s transportation system by expanding the regional transit network and providing resources for local transit, roads, walking and cycling, and more. Read the full report and supporting documents below.